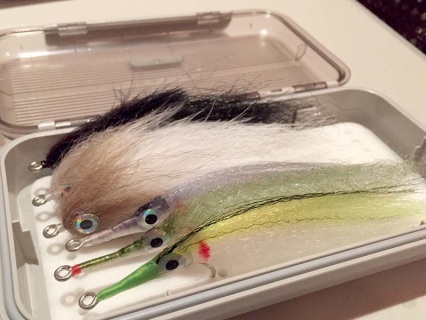 All Bonefish Flies are Australian made, and tied to order by Darren. Our flies are all tied on premium Gamakatsu LS11-3H, SL11-3H & SL12s hooks. 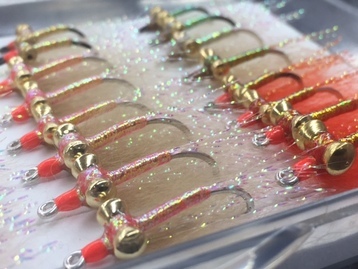 These hooks are by far the strongest saltwater hooks for this type of fly fishing. Eyes available include bead chain for shallow water & spooky fish, 1/8" & 5/32" dazel eyes for mid-shin/knee deep water, right up to 3/16" dazel eyes for the deeper water/drop offs & #2 hooks. The essential Bonefish Fly selection for CI incorporates a number of flies in multiple colours and weights to match the conditions. 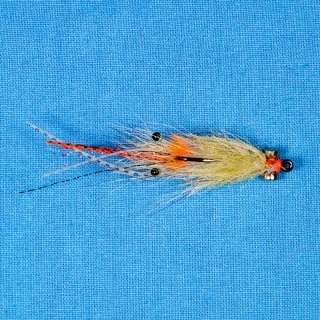 Expect to loose 6-12 flies a day through bustoffs and wear and tear. We coat our Bonefish flies with UV epoxy to increase their durability, and use Finn Raccoon across the range as the winging material. The epoxy is both expensive and time consuming, but it is common for customers to catch 20-40+ fish on the one fly! The Finn Raccoon is a natural material that gives the fly wonderful movement and translucency in the water. We purchase premium fashion grade pelts from Europe and these are extremely expensive, but absolutely worth every cent. but they ARE the best. It is important to know that your pliers wreck more flies than Bonefish, so go easy when releasing your fish! CI is a long way from anywhere, don't make the common mistake of turning up with 2 dozen flies and expect them to last the week. 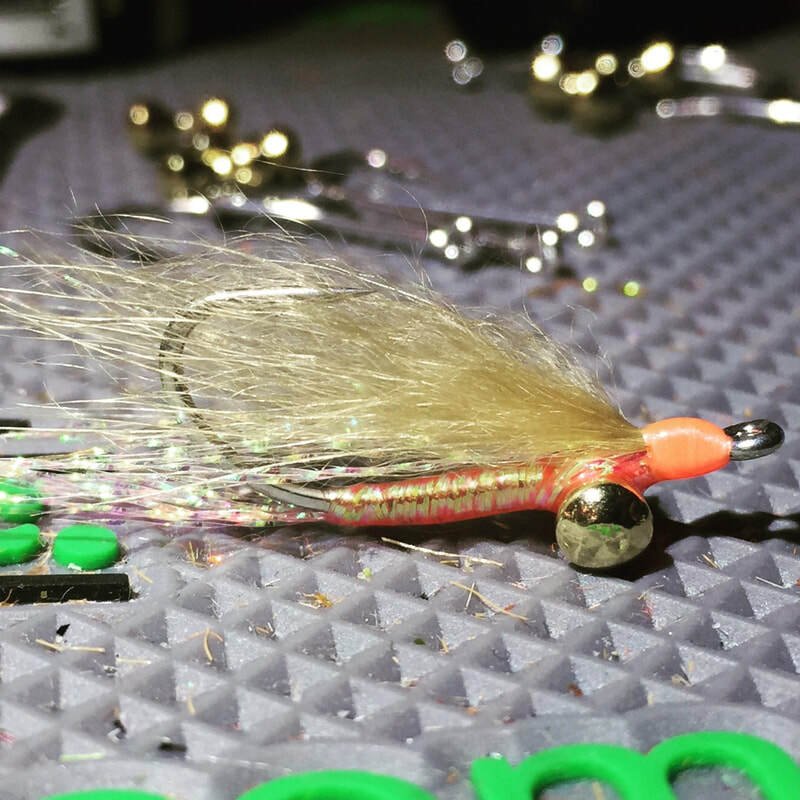 Flies will probably be the cheapest part of your trip, so make sure you have plenty, and that they are tied on quality hooks. It is the fly that the fish eats (or doesn't eat). 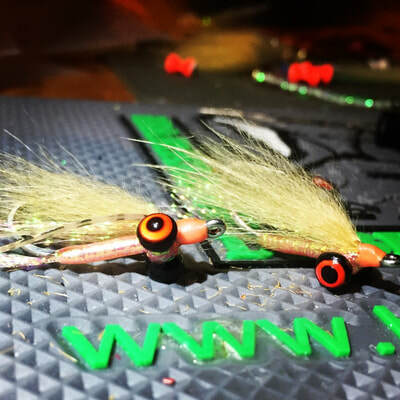 We tie our custom Bonefish flies to order, so please contact Darren via the form below to enquire on current waiting time if your order is urgent. 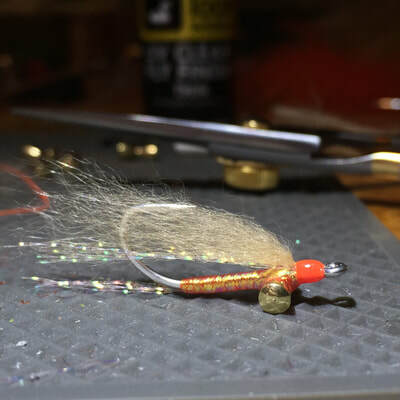 The classic Christmas Island Special fly tied my way. A real Christmas Island success story. The Ringburner is simply my take on the popular orange CI Special, incorporating an overwing of Fl Orange Finn Raccoon. This natural material gives the fly wonderful movement and translucency in the water, something you can't duplicate with synthetic materials. The Ringburner is my bread and butter pattern for CI, and is an essential addition to any flybox in a range of eye sizes from bead chain, to 3/16 brass. 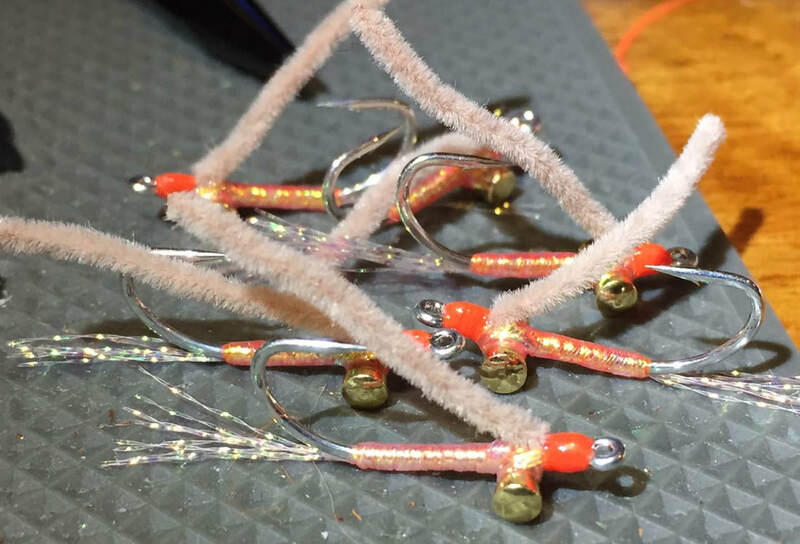 Ringburners are coated in UV epoxy, and like all my bonefish flies, are the most durable you can buy anywhere. 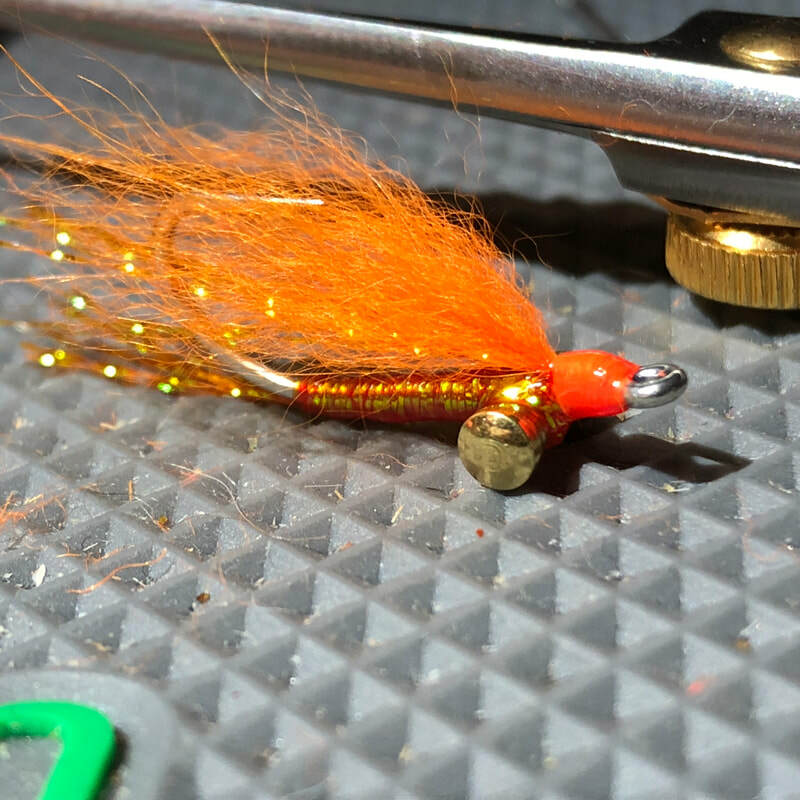 Another classic fly. 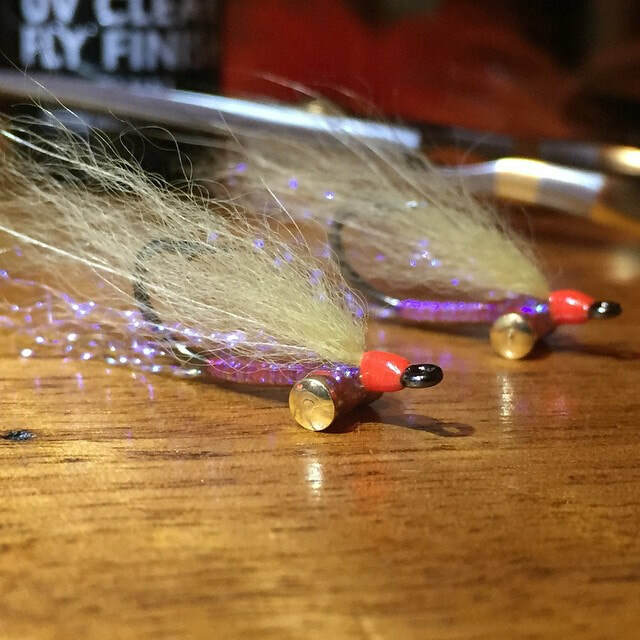 I found this to be a great afternoon fly and spooky fish fly. These are also coated in UV epoxy, making them EXTREMELY durable. Tied on a #10 or #8 Gama L11S-3H hook with brass eyes and UV Krystal Flash & Camel Finn Raccoon. This fly is catching plenty of fish! This is an ideal mix for Christmas Island. 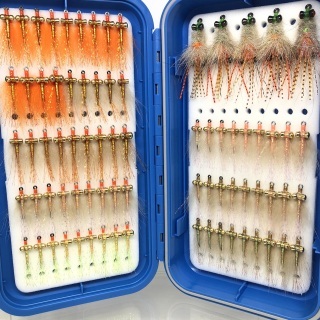 It contains a fantastic range of flies with a wide assortment of eye sizes. The 5 doz selection comes with a waterproof C&F 1644 fly box. Includes FREE Delivery in OZ or Overseas. This is a premium C&F CFGS 3500 box, jam packed full of the CXI big hitters. 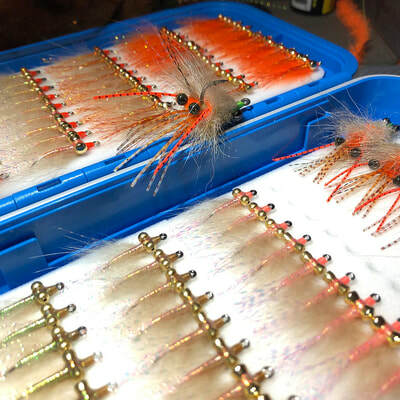 It contains 72 bonefish flies, and 5 Trigger flies. This is the only way to get your hands on some of my "Squish's Shrimp" Trigger flys. 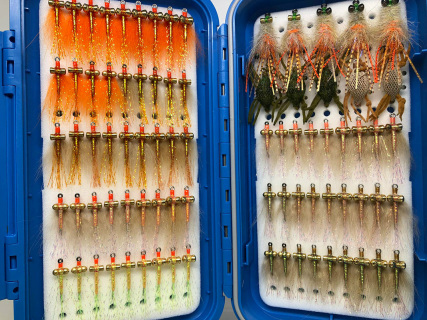 It contains 72 bonefish flies, and 10 Trigger flies. 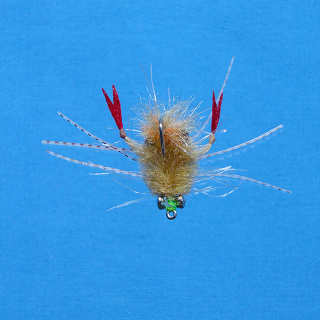 Its the same as the regular CXI Big Boy Selection, but also has 5 Alphexo Crabs, which are another great Trigger fly. 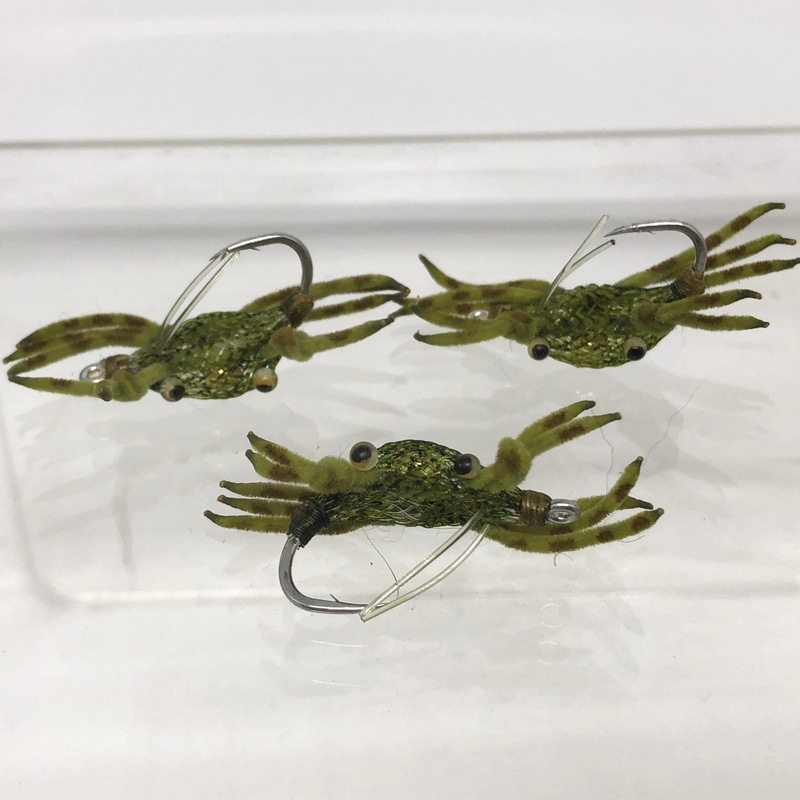 These selections are the only way to get your hands on some of my "Squish's Shrimp" Trigger flys. "Absolutely terrific. I'm glad I took your advice as well as ordering five dozen. I was the "go to" guy for the entire group as we were all first timers to this location and I was the only one with flies that consistently caught fish. They all know your name now...... We toasted you in the bar on several nights." "I was happy as soon as I laid my eyes on my selection bonefish flies tied by Darren, they just looked good. When I got the flies to CXI it turned out the bonefish liked them as much as I did, possibly more. Tied on super strong hooks that didn’t bend on the strong pulling bonefish, I’d recommend them to anybody looking for quality bonefish flies." "My order from Darren arrived very quickly. When I unpacked the flies, I was very impressed. His eye for proportion and symmetry is very good. The flies were very consistent. 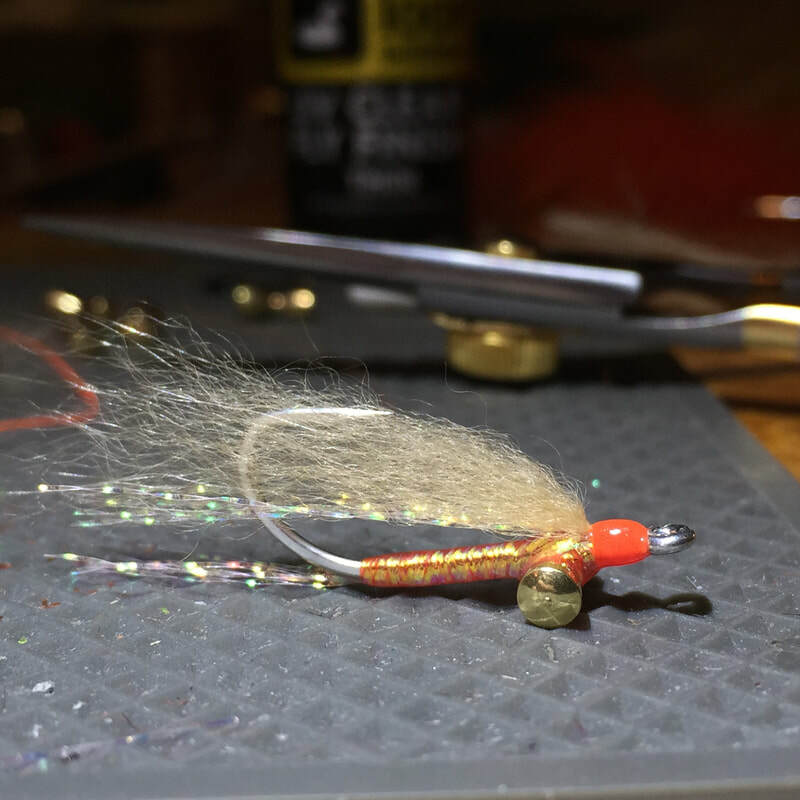 His flies are tied with the finest components, and these were the equal of any bonefish flies I have seen anywhere, I think that they are that good! 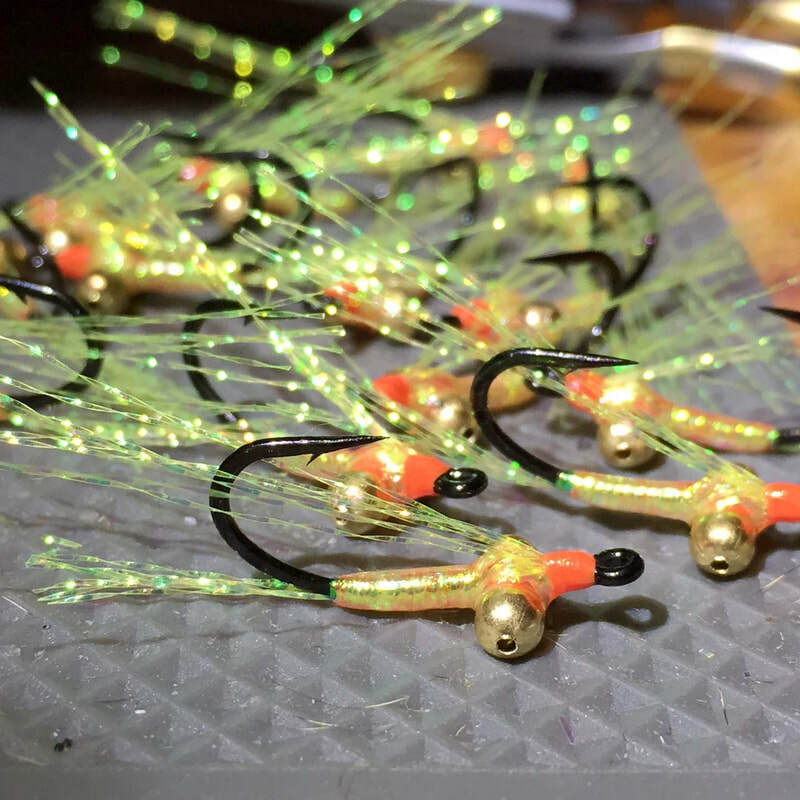 Discussing these flies with Darren , it becomes apparent that he has put a lot of thought and research into the selection and construction of his bonefish flies. I will be ordering more. Thanks Darren." "I have used MANY different flies on Christmas Island ..the last trip I was there , I used predominantly Darren's flies ...with GREAT success! !....Subtle variations really do make a difference to the hook-up rate ...the rest ...well, up to me! 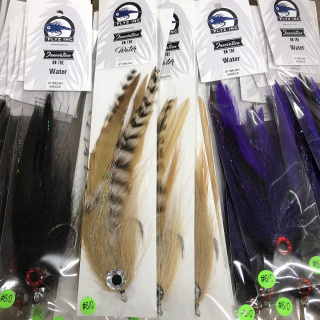 !...I am going again, and WILL be ordering another batch ....Paul"
"I recently received a couple of dozen of these bonefish flies and can say I am very impressed. Darren focused on his favourites including the orange raccoon ring-burner, the George Bush and some varied CI specials. They are incredibly neat flies with fantastic proportions. Darren matches the hook and eye size carefully and it shows. They will surely get eaten. I look forward to taking some snaps of them in bonefish mouths in August." 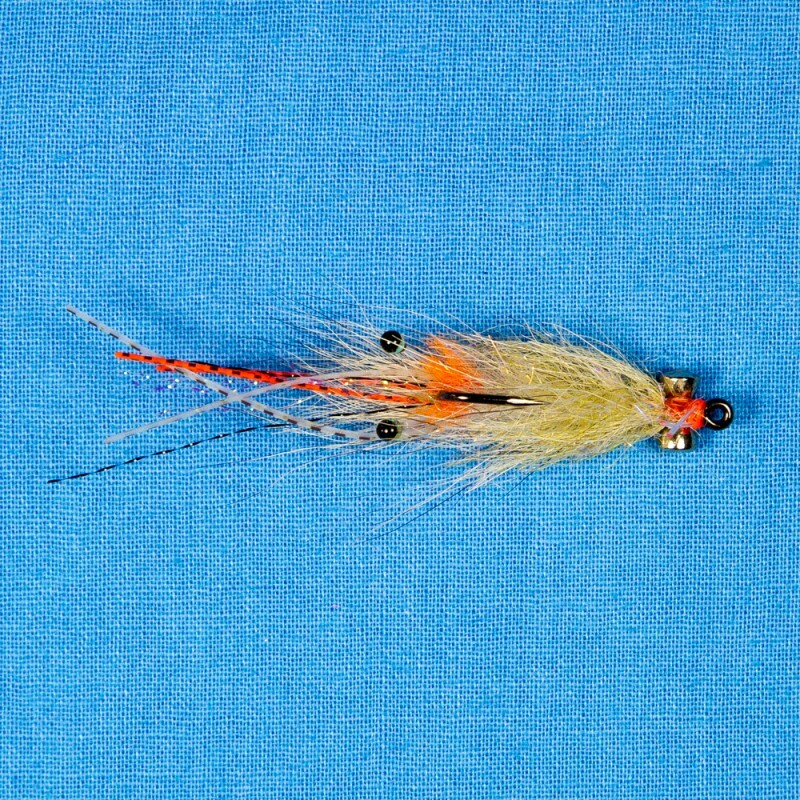 "Darren ties very good flies in patterns that work. Don't hesitate and buy some!" 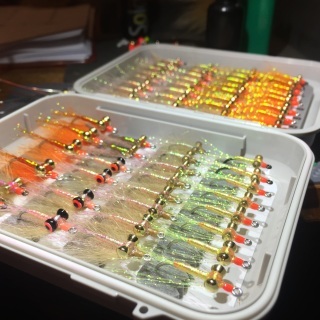 "When I opened my fly box full of Darren's flys the CXI Guide's eyes lit up. " Very nice flys" were the comment's from them. It didn't take long for the other fishermen with me to start lining up to raid my fly box ( the American's included). 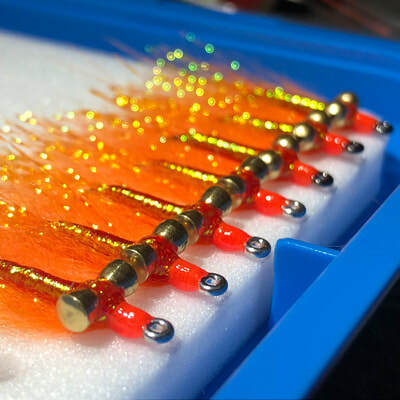 When the boys added their scammed flys to their boxes, they were the first flys the guides reached for because they were guaranteed to catch fish. Yes they are that good! Thanks for the great flys Darren." Yes, we hate web forms too, but unfortunately they are necessary to beat spammers. Darren will reply to your enquiry ASAP, or you can call him direct on +61 417 558173. Please type this CAREFULLY, it is going to be your return email address for our reply. If you get it wrong, or make a typo, we won't be able to contact you! Unfortunately we receive a LOT of unwanted Spam this step is to try and beat automated computer spammers and unwanted sales email.